Scott Coupland of Deeping Rangers scored his 32nd goal of the season at Harrowby United. Deeping Rangers continued their pursuit of long-time United Counties Premier Division leaders Peterborough Sports today (December 26), while star striker Scott Coupland continued his race for a half-century of goals. A solitary Coupland goal 10 minutes before the break was all that Deeping managed at lowly Harrowby, but that was all they needed to stretch their unbeaten run to 19 top-flight matches, the last five of which have been won. Billy Smith (right) scored twice for Wisbech Town at Holbeach United. Coupland is now on 32 goals for the campaign from 31 appearances, but Deeping stay third, six points behind Sports who don’t play until Thursday evening (December 29) when they take on city rivals Peterborough Northern Star for the first time in a league match. Eynesbury stayed second, a point ahead of Deeping, after beating Sports’ forthcoming FA Vase opponents Newport Pagnell 3-1. Sixth-placed Holbeach lost for the second game in a row and lost ground at the top as a result of their 3-1 home defeat at the hands of Wisbech Town. Billy Smith (2) and Michael Frew scored for Wisbech, who are up to ninth, before Ollie Pinner claimed a late consolation for the Tigers. Both players had a man sent off in the closing stages, Sam Murphy for Wisbech and Dan Dougall for Holbeach. Chris Salt (red) scored for Stamford AFC at Rushden & Diamonds. Bourne won the Division One derby at Blackstones 2-0 thanks to a goal in each half from George Couzens and Jack Humphries. Bourne are now 12th, four places and seven points ahead of Stones. 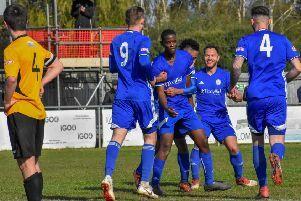 Spalding United are up to second in Division One South of the Evo Stik Northern Premier League after a hard-fought 1-0 home win over Lincoln United. The game was settled by a freak sixth-minute own goal when a divot helped divert a back-pass past the visiting goalkeeper. The Tulips are a point behind leaders Shaw Lane, but the table-toppers have three games in hand. Stamford AFC remain 18th after picking up an excellent away point at in-form AFC Rushden & Diamonds. Former Daniel Nabil Shariff gave Diamonds an early lead, but Chris Salt equalised midway through the first-half for a Daniels side collecting just a second point in their last six matches. Tomorrow’s (December 27) non-league action sees Yaxley take on lowly Huntingdon at In2ituve Park in the UCL Premier Division and March travel to Wisbech St Mary for a derby in Division One of the Thurlow Nunn Eastern Counties League. A win would take Yaxley up two places to fifth, but bottom club Huntingdon held Eynesbury to a draw in their last outing to reach 10 points for the season. Rushden & Diamonds 1, Stamford AFC (Salt).